I think this photo sums up the season for us at the moment! We live off of soup this time of year and like me, my kids are often found with their hats firmly on their heads. These soups were actually from Coop's new gluten free range which we were kindly sent. I wasn't asked to write about them but they were so tasty I thought it was only right to share. We like soup and hats too. Particularly loving pom pom hats at the moment! 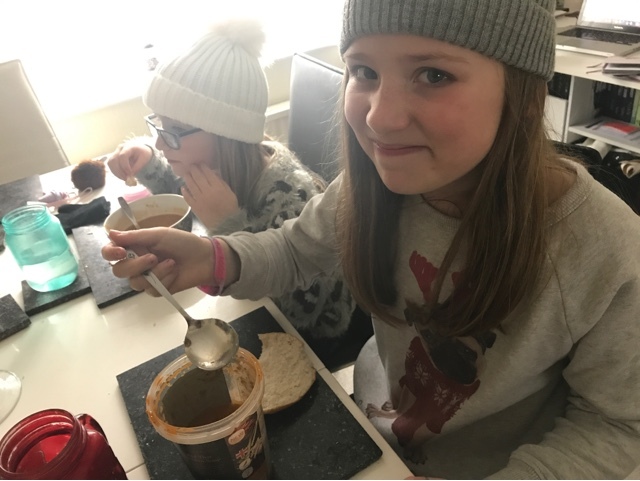 I wish my kids liked soups more, they groan when I serve up homemade soup and fresh homemade bread, yet it is one of my favourite winter meals. Love that your girls wear hats indoors! I'm often found wearing a coat indoors. We never eat soup in our house, maybe we ought to start.